I still have on my Treo most my girlfriend’s old text messages–including those she sent me in 2003. 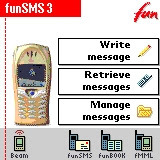 Using FunSMS, as I was able to save messages from my Nokia phones — 7110 and 8250 — on my Palm. I just had to sync thru infrared my phone with my Palm, and all my SMS would be transferred to the latter. And because the Palm OS provides for easy transfer of data from one device to another, there’s no hassle moving the FunSMS database — where all my SMS messages are — as I upgrade to a newer model. FunSMS’s demo version can retrieve messages, but it cannot be used to send SMS. The old demo version that I installed on my Treo also resets my device whenever I try to use it to retrieve messages from my Nokia 7110. While there’s a newer FunSMS version for newer models, I have yet to try it. For now, the older version is on my Treo only as a repository of old messages.